Lossy trapdoor functions (LTDFs), proposed by Peikert and Waters (STOC’08), are known to have a number of applications in cryptography. They have been constructed based on various assumptions, which include the quadratic residuosity (QR) and decisional composite residuosity (DCR) assumptions, which are factoring-based decision assumptions. However, there is no known construction of an LTDF based on the factoring assumption or other factoring-related search assumptions. In this paper, we first define a notion of adversary-dependent lossy trapdoor functions (ad-LTDFs) that is a weaker variant of LTDFs. Then we construct an ad-LTDF based on the hardness of factorizing RSA moduli of a special form called semi-smooth RSA subgroup (SS) moduli proposed by Groth (TCC’05). Moreover, we show that ad-LTDFs can replace LTDFs in many applications. Especially, we obtain the first factoring-based deterministic encryption scheme that satisfies the security notion defined by Boldyreva et al. (CRYPTO’08) without relying on a decision assumption. Besides direct applications of ad-LTDFs, by a similar technique, we construct a chosen ciphertext secure public key encryption scheme whose ciphertext overhead is the shortest among existing schemes based on the factoring assumption w.r.t. SS moduli. The first author is supported by a JSPS Fellowship for Young Scientists. We would like to thank the anonymous reviewers and members of the study group “Shin-Akarui-Angou-Benkyou-Kai” for their helpful comments. 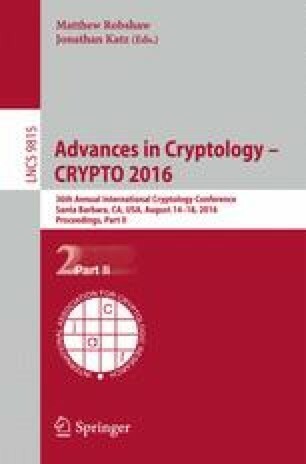 Especially, we would like to thank the reviewer of EUROCRYPT 2016 who suggested to use the term “adversary-dependent” instead of “generalized”, and Atsushi Takayasu for giving us useful comments on the Coppersmith theorem. This work was supported by CREST, JST and JSPS KAKENHI Grant Number 14J03467.